With persistence one can stand eggs on end at any time of the year, though it may be slightly easier to do so at the time of the equinoxes. The new gravitational theory provides a scientific explanation for this phenomenon that hitherto has been discounted by most scientists as being more myth than fact, attributed to such things as imperfections in the egg surface that provide a small tripod on which the egg can be stabilized. 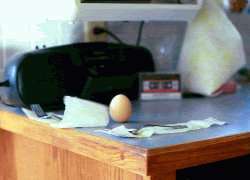 Standing an egg on end is a very simple experiment providing compelling evidence for the existence of diallel gravitational lines as set forth in the new Gravitational Theory. David Allan conducted a careful experiment using the scientific method as best as the constraints of the home laboratory (i.e. kitchen) environment can provide. The experiment was conducted over one full quarter of a year to show that eggs can be stood on end any day between a solstice and an equinox, even in the presence of minor perturbations such as those found in the kitchen counter-top environment. Because of the 23 degree tilt of the earth's spin axis, there is a degree of symmetry during an equinox when the earth's spin axis is exactly at right angles with the direction to the sun from the earth. At this point the diallel gravitational field lines of the earth and the sun have perhaps a more complimentary symmetry, causing minimal distortion from the vertical for these lines at this period, according to the new Gravitational Theory. This means that free electrons in an egg can travel along these vertical diallel field lines, perhaps providing somewhat improved stability of the egg standing on end during the equinox period. Again, the theory predicts that an egg can be stood upright on any day of the year if there are enough free electrons present and the local diallel gravitational field lines are not perturbed from the vertical. This has been proven. See notes below. There is a slight complication in this experiment because an egg is not exactly symmetric about its axis. The yoke is typically set off to one side, and with different densities between the yoke and the white or clear portion, this will typically lead to some natural imbalance. Also, an egg as it ages will have the white pull away from the wall at the end of the egg. You may have seen this in a boiled egg. A fresh egg will be fully filled. The reason the egg is stabilized in the vertical is from the principle of least action (Fermat's Principle). According to this new theory, the electrons flow freely up and down the diallel, gravitational-field lines in the egg -- reflecting off of the walls of the egg as a natural boundary. The longest direction for the diallel lines, and hence the lowest frequency (lowest energy condition) for their oscillation up and down these diallel lines, is when the egg is vertical. See the energy diagram. Since nature (Fermat’s Principle) tends to the most efficient state, that condition for these free flowing electrons is when the egg is vertical. There will be a very weak RF field emitted by the egg as a result of this oscillation. This frequency will increase when it is laying on its side -- the length to the width dimension of an egg being roughly 5:4. Such a measurement would provide a direct test of the model for this new theory. This has not yet been measured as the equipment to do so was not available to the author. The following are notes from D. Allan's experiments conducted in 1999 during the period of the autumnal equinox (23 September) through the winter solstice (22 December). 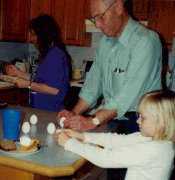 Years ago, during an equinox in Boulder, Colorado, I remembered our family having six eggs standing on end on the kitchen counter. At that time I remembered not having a clue as to why this might work. Standard gravitational theory could give no explanation, and we had no insights to the new theory at that time. 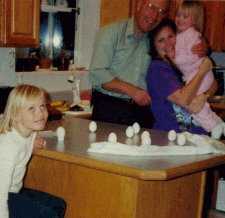 On 18 September 1999, I bought a dozen fertilized eggs. On the 21st, I made the attempt to stand each of them up; I was only able to stand up one of 12. They had been in the refrigerator since the 18th. The evening of the 21st, I took the eggs out of the refrigerator. At 9:00 a.m. on the 22nd I was able to stand up two. I then took some fine emery cloth and carefully rounded off the bottoms to make them smooth and round to make sure there were no mini tripods that might hold up the eggs. The exact time of the equinox was at 5:23 a.m., Mountain Standard Time 23 September. At 1:00 a.m. MST, I was able to stand up four eggs, and I left them overnight. They were still standing in the morning. Because my wife was canning fruit, there were many flies. I noticed the eggs did not fall over when flies would walk around on them. Two fell over when my wife closed the dishwasher, which was immediately underneath the counter top where the eggs were standing. At 8:00 p.m. the two were still standing, and I was able to stand up five more. I was able to stand one of them within seconds. The moon was full, which theoretically would augment the diallel field line symmetry between the earth and the sun. A strong breeze came through the kitchen, and I feared they might blow over. Not so. I called Peter Jacobson with whom I had shared the explanation of why eggs would stand on end. He had called, all excited, having involved his whole family who got six eggs to stand on end. His Grand-daughter, not knowing the difference, got one to stand on the small end. All seven of my eggs were still standing in the morning. I took a picture. One fell later as Edna bumped the counter nearby. A breeze came through the kitchen -- picking up some paper towel strips I had laid out to keep the eggs from rolling on the floor should they fall. Two of the eggs fell as the paper towel flew through the air and hit them, but the rest remained standing. Later in the morning two more had fallen over for unknown reasons. It looked like one had rolled into the other. As part of this experiment I tried on repeated occasions to stand an egg up on the top of our grand piano -- thinking it would make a great picture with the light colored egg reflecting in the hard polished surface of the piano top. Try as I may, I could not. At 1:30 p.m. 24 September I got 9 fresh (out of the chicken yard and probably fertilized) eggs, some of them still warm, from Paula Hiltbrunn. I told her of the experiment, and went in her kitchen to demonstrate. I couldn't get one to stand on her counter, then I discovered that it was significantly tilted. I went to her stove top and tried two. The first would not readily stand, but I had the 2nd standing within a couple of seconds. 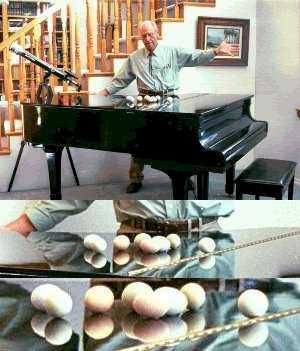 I could not get any of these eggs to stand on the top of the piano upon my return home, try as I may. I got two to stand for a couple of seconds, then they would topple. Usually, once you get an egg standing, it will remain for a long time. At 1:45 a.m., 25 September, wanting to have the moon lined up, I tried again to get an egg to stand on the piano with no luck. I then went in the kitchen, and got three to stand on the counter rather quickly. We also have an upright piano. The same thing held true there as with the grand piano. I could not get any to stand except for just a fraction of a second. I left four standing on the kitchen counter and went to bed. In the early morning hours, it occurred to me: "PIANO WIRES!" They will conduct current and set up interfering fields which could either attract or repel that of the egg, causing it to be unstable in that environment. In the morning, there were 3 eggs still standing in the kitchen. As Edna was watching them, a breeze came and blew one down. She watched the other two wobble slightly, but remain upright. At 11:00 p.m., after returning from being away for the day, the 2 eggs were still standing. When we left for San Diego on 30 September, one of the two eggs was still standing, surviving a week of canning in the kitchen. The other had fallen from bumping the counter. I had three eggs standing before we left, and all three were still standing when we returned a week later. I tried from time to time to stand an egg on another counter top, under which pots and pans are stored, but the eggs tended to be less stable than on the other counter top. Whether it was the egg or the environment, I am not sure -- maybe both. I purposely did the main experiment over the dishwasher and in the kitchen to provide a perturbing environment. 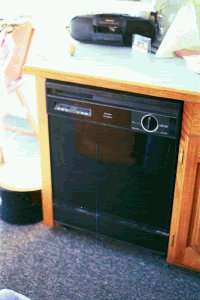 Running the dishwasher located under the primary counter top did not cause the eggs to topple, nor did unloading it or loading it from the sink adjacent to and contiguous with the counter top on which the eggs were standing. One day when a Fall breeze was blowing through the kitchen, I took some pictures of the breeze lifting a paper towel up into the air, and directly behind the blowing towel was the primary egg standing on end. The active diallel-line servo keep the egg standing with a breeze of sufficient velocity across it to lift up the paper towel. I saw this repeated several times. 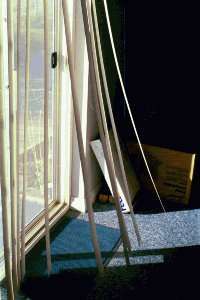 Force of breeze blowing into kitchen is illustrated by degree of displacement of the screen door curtains 10 feet away. Breeze blows paper towel upward next to egg which remains stationary. Over the course of the three month quarter for the experiment, we had one or more eggs standing all of the time, except for those short moments when the counter on which they were standing was bumped hard enough to take the egg(s) outside of the servo control bandwidth. Sometimes they were tipped over by other objects hitting them. Almost always, I could set them back up quite quickly. On several occasions, I observed the egg go through a series of tiny damped oscillations as it would find its point of maximum stability — disproving the tripod theory. I found no significant difference as to whether I sanded smooth the bottom of the eggs or not. We were able to keep one of the eggs standing from 25 September to 23 December with the momentary exceptions when it was bumped over by some significant perturbation; and I would stand it up usually quite quickly. Toward the end of the three months, it became increasingly difficult to stand up this particular egg. I found a similar attribute with another egg. I was able to keep it standing for about three weeks; but then I could not get it to stand at all. 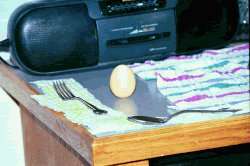 Apparently, as an egg ages, its electron conductivity changes. Also, I noticed that warm eggs tend to stand better than cold eggs. Yesterday, I stood up a boiled egg that had been part of the previous experiment, and which had stood for well over a month. This morning while lying in bed I had come to mind a simple way to repeat the experiment where the egg toppled toward the direction of the wind when it suddenly let up. At 5:30 a.m. I set forth to simulate the breeze conditions that caused this highly unusual phenomenon. I would gradually increase the velocity of my breath blowing across the egg and then let off suddenly. I repeated this several times and was amazed at how stable the egg was. I could see the egg wobble as its servo was compensating during some of these times. Finally, I got it to topple over. It did exactly as predicted according to the new theory. It toppled in my direction. All of the data from this three month experiment are consistent with this new gravitational theory, and afford a simple and very important validation. BadAstronomy.com: Only on the day of the Vernal (spring) Equinox, can you stand a raw egg on its end.